"The right car, at the right time." That's how Ford chooses to describe the EcoSport (pronounced Echo-Sport). The Indian SUV/MUV market is experiencing a surge and Ford is looking to ride the wave with their latest offering. Ever since the concept was unveiled at the 2012 Auto Expo, the EcoSport has been grabbing headlines, making it one of the most anticipated models for 2013. After mulling over the date of the launch, Ford is finally ready to unleash their weapon. Is the EcoSport, considering the immense interest it has generated, worth the wait? Let's take off the wraps. It's a looker. No two ways about it and that's the biggest USP of the EcoSport. Ford always gives their cars an edgy look using their kinetic design language. Only that in the EcoSport they have taken it one step further. While most concepts lose most of their charisma when they hit the assembly line, Ford has retained almost everything from what we saw at the Auto Expo. Ford designers have combined the road presence of an SUV with the sportiness of a hatchback and the blend seems perfect. The look is unique enough to guarantee double takes. Viewed head on, Ford's large signature grille and the EcoSport's height add to the SUV's character. The wraparound headlamps are sleek and edgy and flow nicely with the angular bonnet while separated circular fog lamps sit in a chrome housing that's mounted on the bumper. Move to the side and the compact nature of the SUV is clearly visible. It is less than four metres in length, making it only slightly longer than the Honda Jazz and the Fiat Punto. The door-mounted spare tyre adds to the overall length though along with a bit of panache. Despite the short overhangs and a fully flat bumper, the SUV still looks proportionate. The smooth flowing silhouette and the car-like low window rake angle not only make it look attractive but wind-tunnel testing has proven that it has a low 0.365 drag coefficient. The A-pillar is quite thick but a small quarter glass improves visibility. The fenders aren't as well defined (like it is in the Duster for e.g.) but are prominent. The shoulder line runs from the front fender to the tail lamps giving the side a bit of character. A high belt line sweeps upwards towards the rear window giving the SUV an aggressive stance while a compact quarter window at the back merges with the blackened D-pillar to give a wraparound glass effect. Large, multi-spoke 16-inch wheels are standard in the top variants and add to the EcoSport's sporty character. At the rear, the spare tyre takes centre stage. It isn't covered and gives the SUV a rugged look. The angular tail lamps are sharp and wide. A clever bit of design has gone into the placement of the rear door handle which is actually built into the right taillamp. The chrome strip running across that tail lamp has a button that electronically releases the hatch. This clever camouflaging gives the rear an uncluttered look. The only catch is that the door opens towards the left which will take Indian customers a little time getting used to. The rear window is stylish but its size hampers visibility. The rear bumper is part of the cladding that flows in from the sides - looks chunky and houses two reverse lamps (like in the old Pajero). The EcoSport, on the inside, is very similar to the Fiesta. However, the dashboard is scooped out and the air con vents are angular and not circular like the Fiesta's. The climate control switches are similar but placed higher for easier access. The phone keypad inspired centre console buttons are a nice touch. The quality of material is good and fit and finish is definitely the best in segment. 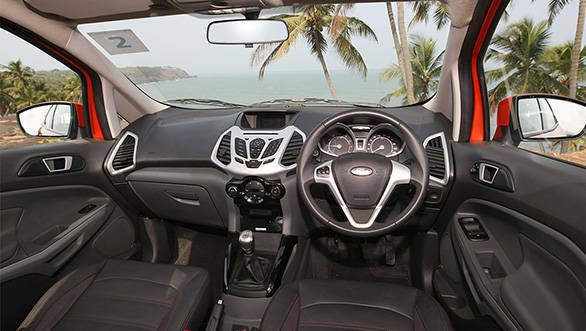 The EcoSport's cabin is a nice place to be in. The seats are attractive (black leather with red stitching in the top end Titanium (O) variant) but up front they don't offer enough lumbar or thigh support. Shoulder room is cramped and is one of the reasons why only the driver seat gets a foldable armrest. Seat height adjust is standard, except in the base Ambiente variant. At the rear, Ford has managed to free more space. I'm 5ft9in and with the front seat set to my comfort levels, there still is adequate knee room at the back. It isn't as impressive as the Amaze but it's still comfortbale for a sub four-metre vehicle. Head room is sufficient too, but the shoulder room at 1170mm is poor and is 150mm less than the Duster's. This makes putting three adults at the back, a squeeze. There is also no centre armrest for the rear occupants but more surprising is the absence of grab rails. The passengers will have to hold onto the door handle in order to stay in place and that's not a logical place to grab onto in an emergency. The EcoSport is big on storage though - there are 20 storage places including 9 bottle holders and there's storage under the front passenger seat too. There's also a 12v power outlet at the edge of the rear seat. Boot space is just 346 litres, however. In comparison, the Honda Jazz and Renault Duster offer 38 and 129 litres more, respectively. However, the low loading lip and deep boot (due to the spare tyre mounted on the door) helps one place taller bags without much bother. Furthermore, the second row seats split 60:40 and fold down to offer 705 litres improving boot space hugely. 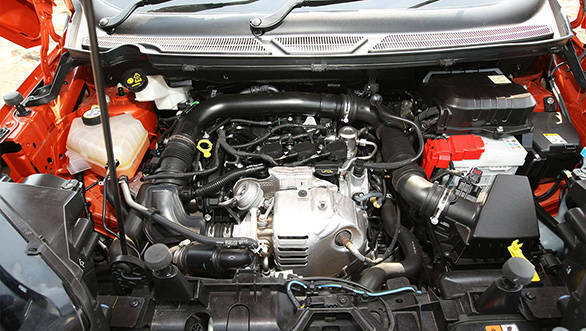 Looks is one highlight of the EcoSport but it's the new EcoBoost engine which is the true focus of the SUV. And it is this engine we have tested. The compact 999cc, three-cylinder, turbocharged unit produces a whopping 125PS at 6000rpm. Peak torque of 170Nm is available from a low 1400rpm all the way to 4500rpm (unheard of from a conventional petrol engine). India is the first country to get this engine in the EcoSport and it's also the most compact turbo-petrol engine in the country today. The direct-injection DOHC engine features continuous variable valve timing for both intake and exhaust valves. Crank the motor and unlike other three-pot motors, vibration on this one is well subdued. Start driving and there isn't any uncomfortable surge in power; the delivery is linear but potent. The typical three-cylinder thrum is evident but the engine sounds nice at higher revs. Lift off the throttle and the blow-off valve's hissing sound reminds one of the turbo inside. There is also very little lag and thanks to the healthy torque low down, one can drive around with minimal shifting. Throttle response is immediate as well. The engine is mated to a five-speed manual and like most Fords, the shifts are smooth, precise and with short throws. Performance wise we expect the EcoSport to take about 11.5 seconds to hit 100kmph which isn't bad considering the ARAI specified fuel economy figure for the EcoSport is a commendable 18.9kmpl. The EcoSport borrows the Fiesta's MacPherson and torsion beam suspension setup but it is been strengthened and stiffened. The Fiesta is known for its class leading handling and it seems to have passed this on to the EcoSport. Despite the height and 200mm ground clearance, body roll is tightly controlled. The chassis is well balanced and we think it's the best handling SUV in its class. The steering also weighs up well at speeds and is quick and precise. It could do with better feedback though. The SUV runs 205-section tyres supplied by both Goodyear and MRF. We found the latter lacking in grip under cornering and hard braking but the Goodyears held up well. When it comes to ride quality, the EcoSport is no match for the Duster, the stiffer suspension setup being the culprit here. So, while the setup aids agility, the ride takes a beating over rough and broken roads. It does handle undulations well, though. The one thing missing however is a 4x4 drivetrain. The Brazilian version has it but Ford doubts whether they would even offer it here as an option in the future. The front-wheel drive model can still wade through 550mm of standing water though. The EcoSport will be available with two petrol and one diesel. The other units being the 1.5-litre petrol and diesel borrowed from the Fiesta. While the EcoBoost model is only available in two variants - Titanium and Titanium (O), the diesel will be available in four variants, namely - Ambiente, Trend, Titanium and Titanium (O). The 1.5-litre petrol variant meanwhile won't be offered in the Titanium (O) trim. The base Ambiente variant lacks safety features such as ABS and airbags and makes do with a manual air con and front-only power windows. The Trend adds ABS and EBD, rear power windows, steering mounted controls and split seats. The Titanium variant gets dual front airbags, auto climate control, 16-inch alloy wheels and rear parking sensors while the Titanium (O) variant adds leather seats, push button start, six airbags and keyless entry. In addition, Ford's new gen SYNC system makes its debut in the EcoSport and gets a new Ford Emergency Assistance feature - this system automatically sends a voice message and GPS co-ordinates to an emergency operator (108) in case of an accident or when the fuel pump is shut off. All variants get a two-year/one-lakh kilometre warranty. 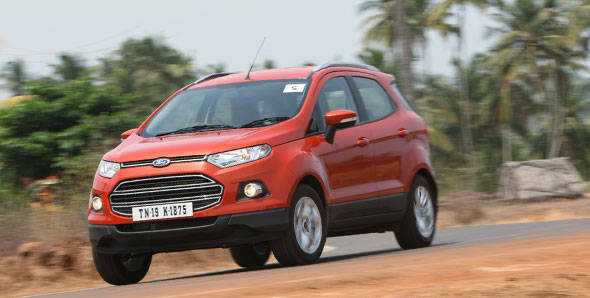 Ford will price the EcoSport competitively to grab market share. We expect ex-showroom pricing to range from Rs 6.5 lakh for the bare bone petrol variant to Rs 10.5 lakh for the top end diesel. This range will help the EcoSport to attract buyers from SUVs, sedans and even hatchbacks. That is a large consumer base which Ford is targeting in the hope to get the numbers. The EcoSport with its edgy looks and EcoBoost engine should boost sales for Ford in India. Bookings start in June and the SUV will roll out in July, in time to wade through our flooded towns during monsoon.The right car, at the right time? Let's see if it becomes the right choice.